Robinson’s Rescue recently received a donation of a Lanier LD 520C Color Multi-Function System from Innovative Office Systems, LLC. The donation is given in memory of Virginia Kilpatrick Shehee, a businesswoman, civic leader, animal lover, and philanthropist who passed away in early July. 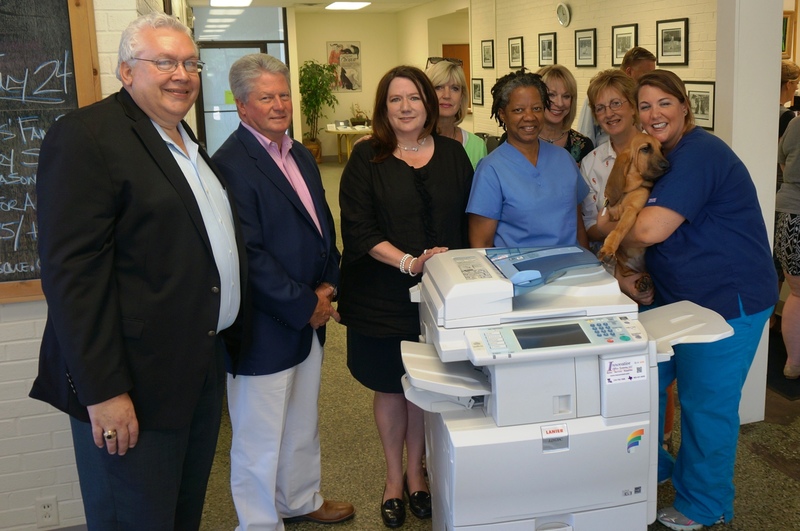 Walter “Walt” O. Bigby, Jr., Owner and Tim Harms, General Manager of Innovative Office Systems have spearheaded this donation to Robinson’s Rescue. Walt’s late father, Walter Oliver Bigby, Sr. was a state legislator from Bossier who served with Mrs. Shehee. Coco, the Shehee family’s dog, “cuts” the ribbon at the Grand Opening of Robinson’s Rescue’s first facility on Kings Highway in 2008. Robinson’s Rescue provides high-volume, high-quality, low-cost spay and neuter surgeries to dogs and cats in the northwest Louisiana region. The organization began in 2005 as an informal group of concerned citizens who met regularly to research best practices and programs in other communities that successfully lowered and eliminated the killing of healthy, adoptable dogs and cats. Robinson’s Rescue “saves lives through prevention” by performing an average of 35 surgeries per day, five days a week. The spay/neuter team has completed more than 35,000 surgeries since opening the facility in 2008. Robinson’s Rescue is facing a number of critical challenges that are increasing the demand for support of the organization. These challenges stem from the fact that the low-cost pricing structure has not changed since 2008, though overhead, including office supply and veterinary supply expenses, have increased significantly as the organization has grown.